An initial outreach effort by the U.S. Attorney’s Office entitled, “Improving Criminal Justice Outcomes,” was held on March 1, 2016, and focused on community stakeholders. The keynote speaker was Michael G. Santos – author, motivational speaker, life coach, trainer and prison consultant. Mr. Santos served 26 years of a 45-year federal prison term for drug offenses. Mr. Santos developed the “Straight A Guide Reentry Course” and the “Earning Freedom Mastermind Reentry Course.” These programs have been adopted at several penitentiaries and have been lauded as exceptional in preparing inmates for becoming law-abiding, contributing citizens. Mr. Santos spoke to the group via videoconference about his own personal journey through 26 years in federal prison, the challenges faced by those in prison and the opportunities for reentry into the community. 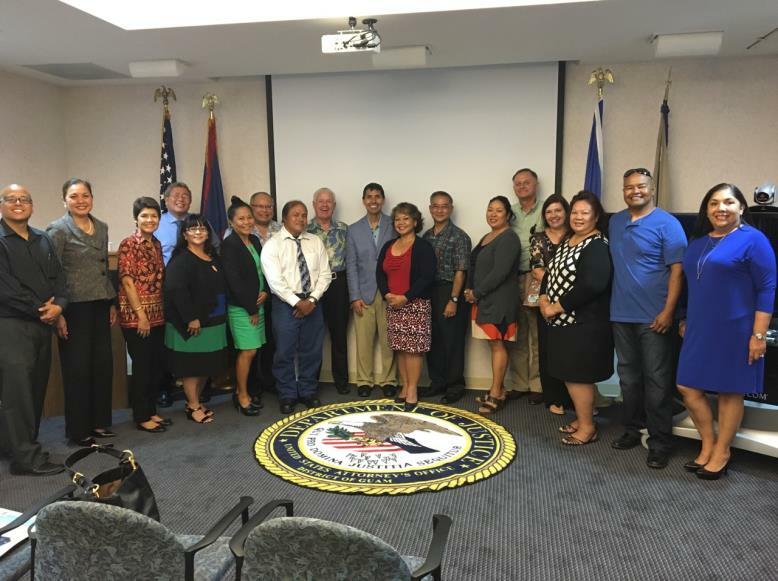 In June 2016, the U.S. Attorney’s Office hosted its second conferences, “One Community Guam” and “One Community CNMI”, this time sponsoring Mr. Santos to provide in-person training to both districts. Upon his arrival in Guam, Mr. Santos hit the ground running by meeting with three groups of inmates at the Department of Corrections and, later, parolees and their families, to discuss the importance of cognitive and life skills development. On June 27 and 28, 2016, Mr. Santos trained at six venues on Guam, and on June 29 and 30, 2016, he travelled to and trained at two venues in Saipan, NMI, to meet with key stakeholders. Training 2 was conducted for adult and youth corrections staff including corrections officers and caseworkers, social workers, and medical, mental and public health professionals, working within or associated with the correctional institutions; law enforcement/prosecutors; public defenders/defense counsel; pretrial officers; probation officers; parole officers; and other related professionals working with our criminal and juvenile justice systems. Mr. Santos also conducted training for selected offenders – adult and justice-involved youth, appropriate to act as peer facilitators for other adult offenders and justice-involved youth. Training for community stakeholders including our nonprofits, faith based community, government agencies, private sector and military counterparts was also held. Mr. Santos’ reentry course included lessons on (1) how to develop communication skills and why those skills relate to success; (2) how to develop self-directed learning techniques; (3) how to develop critical thinking skills; and (4) how to reject criminal lifestyles and criminal associations. Mr. Santos also explained the “Seven A’s” critical to successful reentry: attitude, aspirations, actions, accountability, awareness, achievement and appreciation. 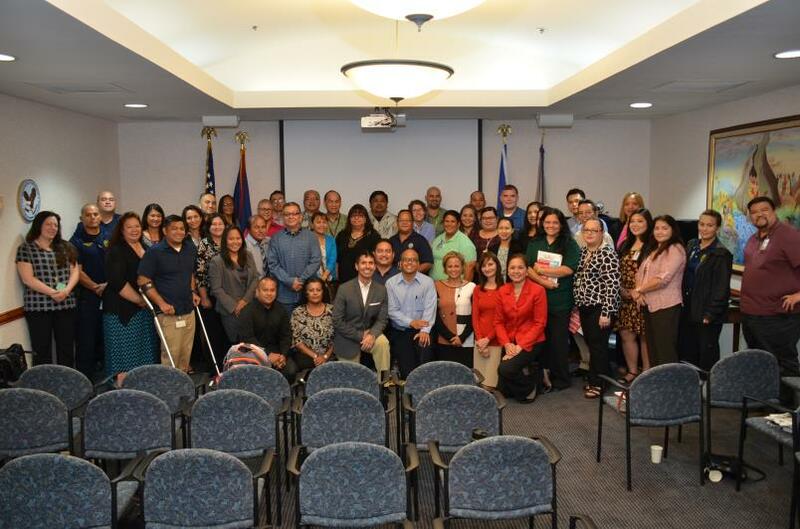 In Guam, the training focused on “Doing Business with DoD” and provided information on contractual, legal and policy requirements regarding base access in Guam and local procedures used to implement these requirements, including: what DoD contracts say about access; DoD / U.S. Department of the Navy (DoN) / Joint Region Marianas (JRM) policies covering base access, including information on the eligibility of individuals with prior convictions; installation specific application access policies; and appeal of the denial process and related information. Panel members included Small Business Advisors, Naval Facilities Engineering Command Marianas; Regional Program Director for Force Protection, Joint Region Marianas; USAF, 36th Security Force Squadron; and USAF, 36th Wing Staff Judge Advocate and Assistant Staff Judge Advocate. Another panel entitled, “What Employers Need to Know” provided information on Equal Employment Opportunity laws and guidance, including the use of criminal background checks and consideration of arrest and conviction records in employment decisions, and the disparate impact on vulnerable populations and their reentry to the workforce; “Ban the Box” legislation; Work Opportunity Tax Credit (WOTC); affirmative action; social security programs; and related issues. Additional topics included an overview of the immigration process and compliance by employers with federal immigration laws, including the Immigration Reform and Control Act requiring employers to verify the identity and employment eligibility of their employees and criminal and civil sanctions for employment related violations. Speakers on this panel included the Equal Employment Opportunity Commission, U.S. Department of Labor, U.S. Department of Homeland Security/Immigration and Customs Enforcement/Homeland Security Investigations, U.S. Department of Homeland Security/U.S. Citizenship and Immigration Services, and Social Security Administration. The last panel entitled, “A Local Perspective: Employment Challenges, Best Practices and Resources,” discussed challenges and barriers to employment, and strategies and approaches, such as the Workforce Innovation and Opportunity Act (WIOA) and Guam’s Combined State Plan for Program Year 2016-2019 addressing workforce needs of businesses and those seeking jobs including individuals who have consistently faced significant barriers to employment such as ex-offenders, Veterans, low-income individuals, individuals with disabilities, homeless individuals, individuals facing substantial cultural barriers, and other vulnerable populations. Additional topics included the Guam Registered Apprenticeship Program (GRAP) which provides incentives for employers who are sponsors of apprenticeships; and relevant local labor and employment regulations, best practices and resources. Testimonials of employers who have successfully employed offenders who have reentered the community were also shared. Speakers on this panel included Guam Department of Labor, Guam Chamber of Commerce, Guam Contractors Association (GCA), GCA Trades Academy, and Guam Community College. In addition, Mr. Santos spoke about his own personal journey, the importance of and critical need for preparing offenders for reentry into the community, and the important role of employers in the reentry process. In Saipan, the training included a session on “What Employers Need to Know.” The speakers discussed information on Equal Employment Opportunity laws and guidance, including the use of criminal background checks and consideration of arrest and conviction records in employment decisions, and the disparate impact on vulnerable populations and their reentry to the workforce; “Ban the Box” legislation; Work Opportunity Tax Credit (WOTC); affirmative action; social security programs; and an overview of the immigration process and compliance by employers with federal immigration laws, including the Immigration Reform and Control Act requiring employers to verify the identity and employment eligibility of their employees and criminal and civil sanctions for employment related violations. The second session was on “Earning Freedom and Reentry,” a presentation by Mr. Santos on his journey through federal prison, the challenges faced by those incarcerated, the importance of reentry programs, and the opportunities for reentry into the community. The third session shared “A Local Perspective: Employment Challenges, Best Practices and Resources.” The panel members discussed challenges and barriers to employment, and strategies and approaches to assist the workforce and businesses in hiring individuals who have consistently faced significant barriers, such as ex-offenders, Veterans, low-income individuals, individuals with disabilities, homeless individuals, individuals facing substantial cultural barriers, and other vulnerable populations; WOTC; and relevant local labor and employment regulations, best practices and resources. The speakers included representatives from the Equal Employment Opportunity Commission; Social Security Administration; Homeland Security Investigations, U.S. Department of Homeland Security; U.S. 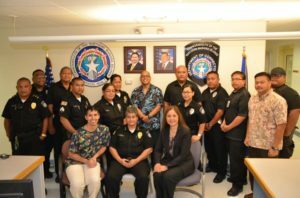 Citizenship and Immigration Services, U.S. Department of Homeland Security; CNMI Department of Labor; Office of Personnel Management; Northern Marianas College; Nutrition Assistance Program and Division of Youth Services, CNMI Department of Community & Cultural Affairs; Northern Marianas Trades Institute; and Island Training Solutions.